Don’t worry, I’m not going to bust any bubbles. I’ve verified it at Snopes.com, and it really is the hard drive from an IBM 305 RAMAC, one of the last computers to use vacuum tubes, in use until 1961. This little baby measured 60 by 68 by 29 inches, including the 50 heavy aluminum disks, pneumatic controls, and an air compressor. It weighed about a ton. It was state-of-the-art for its day. Before this, data was stored on punch cards or magnetic tape, making access pretty slow. It got me to thinking. My first desktop computer came with a 200MB hard drive, but I got into the game rather late. 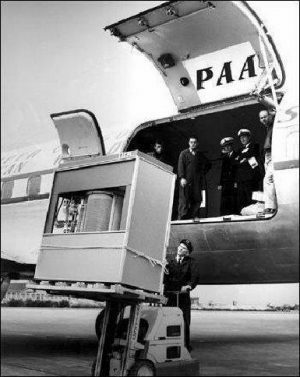 (Lee’s first computer didn’t even have a hard drive.) That’s 40 times the capacity, and it all fit into a unit about the size of a paperback book. The computer I’m writing this on has an 80GB hard drive, which is fairly small in 2008 terms. I can’t take it out to measure it, but that’s 16,000 times the capacity of the 305 RAMAC. On the left is one thin dime, one tenth of a dollar. With it and $4.90 you can get a cup of coffee at Starbucks, or with $3.40, a gallon of gas. On the right is the 2GB memory chip from my new cell phone. You can store many thousands of pictures on it, or record video pretty much until the battery runs down. The 305 RAMAC is 118,320 cubic inches in volume. 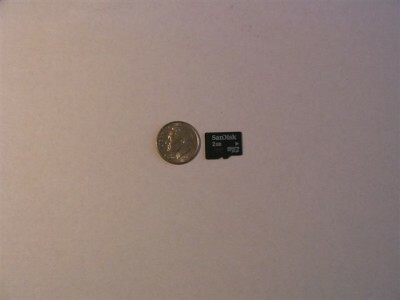 The memory chip measures about 9/16 inch by 3/8 inch by 1mm (.039 inch). That’s .008 cubic inches, or (about) 100 chips per cubic inch. Rounding up, let’s say that 12 million of these chips would fit into a 305 RAMAC console. At 2 billion bytes per chip, that comes to 24,000,000,000,000,000 byes, or 24PB (petabytes, or quadrillion bytes). That’s almost 5 billion times the capacity of the RAMAC. And if you lined up 5 billion RAMAC consoles, edge to edge, they would stretch 4,734,000 miles, or 189 times around the Earth at the equator!